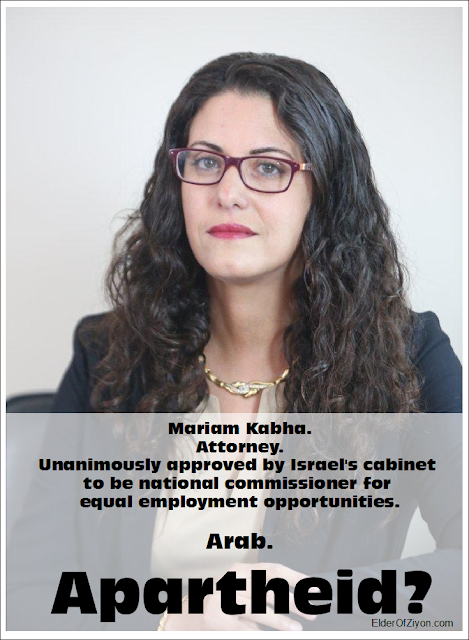 The Israeli cabinet on Sunday unanimously approved the appointment of an Arab woman, attorney Mariam Kabha, as national commissioner for equal employment opportunities within the Economy Ministry. “This is an appointment with high symbolic and practical importance. We have two major missions in the field of employment – to increase employment among Arab women and ultra-Orthodox men. This appointment will serve to achieve a national goal. Mariam Kabha is capable and deserving, and I wish her success,” said Prime Minister Benjamin Netanyahu. Sunday’s appointment makes Kabha the highest ranking Arab female in the civil service, business website Globes reported. A search committee headed by Amit Lang, director general of the Economy Ministry, had been searching for a replacement for attorney Tziona Koenig-Yair, who served in the position for the past seven years. Kabha was chosen for the position from among 60 candidates. All posters in the series can be seen here. What is the goal of foreign policy?